Standard - $1.99 Only 6 left! When Batman is out prowling for criminals to beat up or scouring the city for Bane, he carries tons of fancy gadgets to help him along the way. Smoke bombs, batarangs, his grapple gun, everything a caped crime fighter might need to get the job done. Batman has his utility belt to haul his gear around on, and if he needs more he can just call Alfred and have him drop off a care package. We're sure those packages come in some kind of hi-tech armor case, but we like to imagine Alfred leaves them in a Halloween style treat bag with Batman's picture on it! 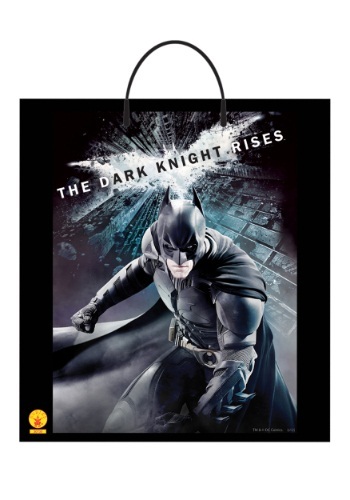 Now your little Bat-fan can have a blast trick-or-treating with this Batman The Dark Knight Rises Treat Bag to haul their loot around in! This plastic bag with a picture of the Dark Knight in action printed on it will hold all the candy they can get their hands on, and still have room for a couple smoke bombs!